So many things seem to happen in May. Our Guild elections have taken place, and I will be President of the Peace Arch Weavers and Spinners Guild for a second year. Hopefully I can use the second time around to improve those things that were new to me last year. 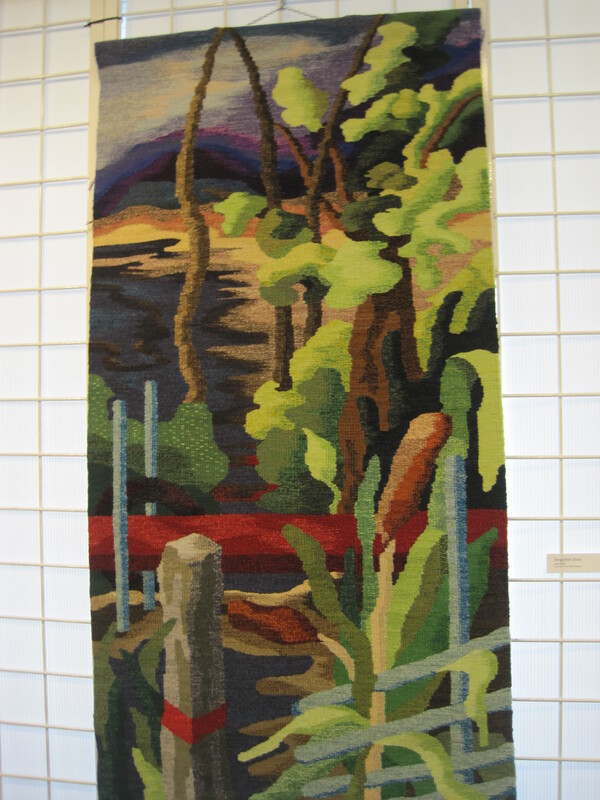 2016 is the Peace Arch Weavers Guild’s 50th anniversary, and lots of “Golden” events are happening. Saturday, May 14th was the annual “Sheep to Shawl” competition at the Surrey Museum in which I was a participant spinner. Our team of six on the floor consisted of four spinners (myself, Yuuko, Shona, Grete) two of whom also manned the hackles for fibre prep, one plyer (Janice), and one magnificent weaver(Ginette). Mary stepped in to help with the fringe twisting. In front of the public we had Janeesha as our steward who rose to the challenge of her first sheep to shawl competition, and Joan who entertained the youngsters in the audience with a smile on her face. We also had a small army of people behind the scenes who worked diligently before the competition to help us prepare. 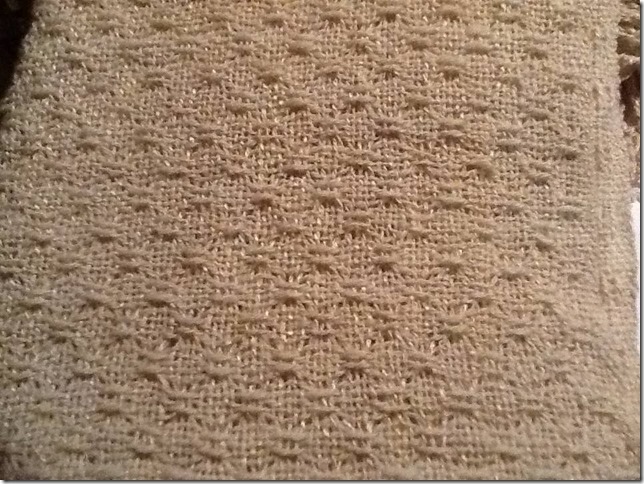 Our shawl was so lovely in a Huck lace pattern. The warp is a combination of Cotswold wool and Muga silk, bringing in the gold for our 50th. The weft was a soft Merino-Romney wool cross. The shawl just glows with golden goodness. We won the competition! Sunday was the opening of the PAWS Guild “Celebrating Fifty Years of Fibre Arts” showcasing 13 PAWS Guild Artists, at the Newton Cultural Centre Gallery. I am honoured to be one of the exhibiting artists. The show will run to May 31, 2016. Beautiful work from our members is on display. The pictures below are: my handwoven scarf, Donna’s felted vest, and Joan’s wonderful tapestry. I love the diversity of our members. 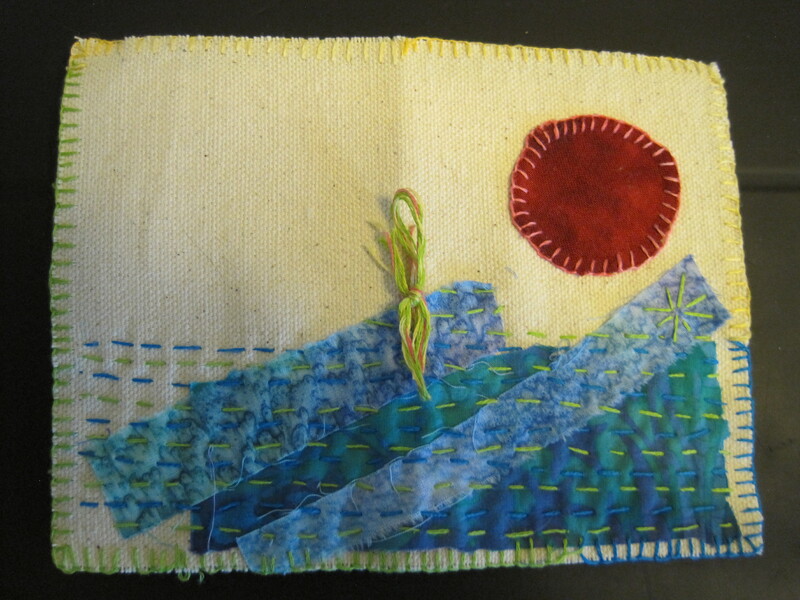 And at the Coquitlam Weavers Guild meeting last week, we were honoured to have well-known fibre artist, Catherine Nichols, conduct a mini workshop on stitching. 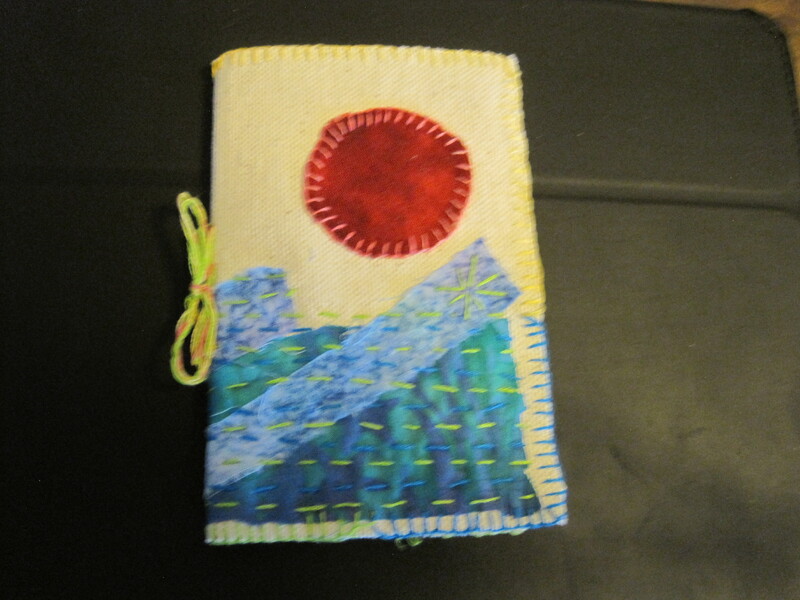 On a small canvas cloth we added fabric and stitch to create a small booklet cover. Catherine is one of the artists featured in the show “Mended” which is currently on display at Place des Arts, Coquitlam for the month of May. Catherine also showed us some of the antique Kantha cloth blankets she collects. Kantha is a form of stitched cloth from India, made by those whose need led them to collect discarded clothing and other fabrics, and stitch them together in layers to create new layered cloths for blankets and clothing. 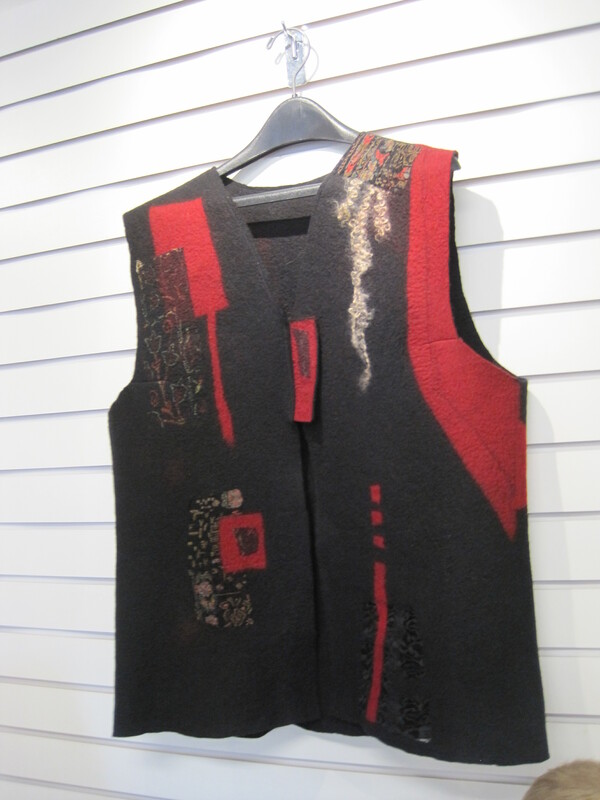 They are beautiful in their simplicity and creative stitching, with a deep connected history. Fascinating. I would love to take a longer workshop with her. 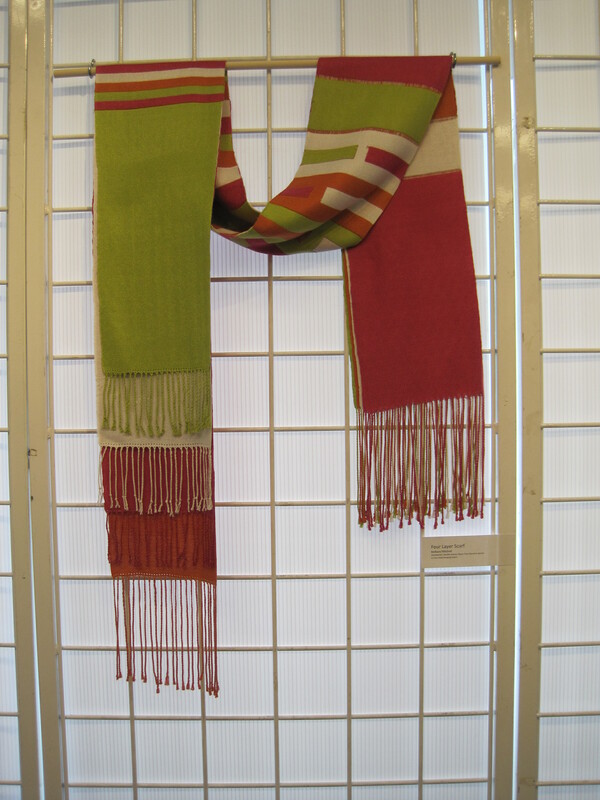 This entry was posted in Uncategorized, Weaving, Weaving Guilds and tagged Arts, Coquitlam Weavers and Spinners Guild, Crafts, felt, Guild, hand weaving, mended, Peace Arch Weavers Guild, sheep to shawl, Spinning, stitched, stitching, Textile, Warp, Weaving, Weft, woven. Bookmark the permalink.